A boy named Billy Dean—born at the very moment terrorists blew up his town, starting World War III—narrates this mesmerizing post-apocalyptic tale from Carnegie- and Printz-winner Almond. 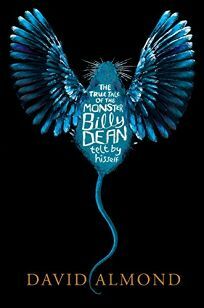 Written in a difficult Geordie dialect, further complicated by Billy's phonetic spellings, the novel speaks feelingly to the love between parent and child, as well as the harm parents can do. Billy Dean's mother, Veronica, was seduced by the local priest; amid the carnage of the "day of doom" on which Billy is born, Father Wilfred persuades Veronica to lock the newborn in a secret back room of her small house to cover up the priest's indiscretion. Billy Dean doesn't emerge from hiding until age 13, slowly acclimating to a crumbling and unfamiliar world: "I am dazzld by the sky that has no end to it & by the numba of things that lie owt ther. I watch the way the breez moves through the rubbl & lifts the dust & how it blows the foliaj of the trees that gro up through the ruwins."